The all-new Corolla Hybrid is the most-efficient version of Toyota's best-seller ever! 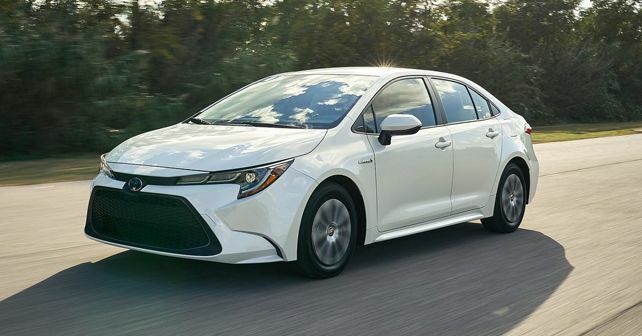 Following the launch of the next generation Corolla earlier in November, Toyota has now given the latest iteration of its best-seller a hybrid heart in the US. And while that may not sound significant in this part of the world, it actually carries a lot of significance because it’s the most efficient version of the Corolla ever. We already know that the new Corolla looks remarkably sharper and more aggressive than any of its predecessor. For a people’s car, the new-gen Corolla has definitely taken a giant leap in terms of design and aesthetics. That remains intact in the hybrid version as well, meaning it looks identical to the combustion-powered version of the car. The powertrain of the Corolla Hybrid is derived from the new Prius, which means it’s a 1.8-litre petrol motor that works in conjunction with two electric motors to develop a joint power output of 121bhp. Power transmission duties are carried out by a CVT and Toyota claims that the car can return 50 miles per gallon (21.25 km/l). There are multiple driving modes on offer, namely, the default Normal mode, Eco for efficiency, Sport for better performance and EV for a pure-electric driving experience. Brake energy recuperation along with Electronically Controlled Brake (ECB) system is also available. The Corolla Hybrid also gets a preload differential that, during low loads, distributes power to the left and right wheels for better handling. At mid-range and high engine loads, the differential works like a conventional open differential. The new Toyota Corolla Hybrid is expected to go on sale only in the US at the moment. There’s no news of it making to our market as yet, but we do expect to see the all-new Corolla arrive here in 2019.